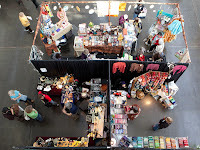 No “Voices in Cloth” show would be complete without a stellar lineup of vendors who bring us the best in fabric, notions, gifts, and all things quilt related. This year’s vendors will feature a wide variety of products and services and are sure to appeal to quilters and quilt lovers of all types. We are pleased to welcome back many of our regulars and extend a special welcome to vendors who will be joining us for the first time. For more information about any of the vendors listed below, please click on the links to their websites. Hand woven silks, marbled cotton, batiks, handcrafted beads and buttons, hand spun sari silk, yarn, etc. Artistry kits, ala mode fiber packets, scarf kits, prism fibers, patterns, ribbons by the yard,etc.